At the time of the Norman Conquest (from 1066) the concept of castles was little known in England. There were no castles in Norfolk at the time, and very few elsewhere in the country. Those few that did exist, significantly, were built by Norman and French lords already here. There is, however, evidence of some earthwork defended houses in the Late Saxon period, for example at Castle Acre (NHER 3449) and probably Weeting (NHER 5626). There had, of course been fortifications in Roman times. Around the 3rd century AD, the Romans constructed a chain of forts along the Eastern Coast possibly in response to barbarian raids from Angles, Saxons and Frisians. Three of these were in Norfolk, at Burgh Castle (NHER 10471), Caister-on-Sea (NHER 8675) and Brancaster (NHER 1001). These ‘Saxon Shore Forts’ were, however, to repel a potential outside enemy, and control trade and shipping. The Norman Conquest led to the building of castles for entirely different reasons. After the final Roman withdrawal in the early fifth century their fortifications were generally allowed to decay. In the period from this departure up until the Norman invasion, the most normal attempt at fortification was the “burgh” – merely a township walled in by a wooden palisade, or even a strong thorn hedge. Having said that, recent evidence has indicated that large regional centres like Norwich and Thetford may have had massive earthwork defences in the early 10th century. The Norman Conquest changed the scene completely. With the defeat of Harold at Hastings, William I (“the Conqueror”) set about building the famous Norman castles, not to repel an outside enemy this time, but to consolidate Norman power after the invasion. William built castles around the country in positions of strategic importance and military vulnerability. However, when the lands of England were divided up between those Norman lords who had supported him, they in turn built their own castles to protect their possessions (most had various lands in different parts of England and travelled between them) and to physically and psychologically impose their authority. These early castles were mostly of a type known as “motte and bailey” castles. They consisted of an earth mound surrounded by a ditch, the fill of which was thrown onto the mound to further heighten it. On top of this was built a wooden tower or “donjon” surrounded by a wooden palisade. This was called the motte, and attached to it was a further defended area called the “bailey”, also protected by a wall or palisade in front of which was a deep moat. Very often, as a further defensive measure, the gateway(s) to the castle were themselves protected by their own earthworks and moats, known as barbicans. 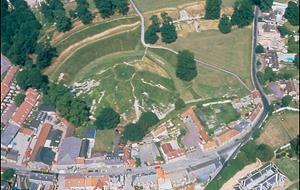 A good example of a barbican can be seen protecting the East Gate of Castle Acre (NHER 3449). Motte and bailey castles had the advantage of being relatively quick to construct, which was important in the unstable years following the Conquest. Most were later developed and improved, with the wooden parts replaced by stone. The best known example of this is perhaps Norwich Castle (NHER 429) which is the only “Royal” castle (i.e. built for William I) in Norfolk. This was constructed in the years immediately following the conquest, so quickly that by 1075 it was in a position to withstand a siege during the rebellion of Earl Ralph Wader. At this stage the motte probably had timber defences, but by the mid 12th century these had been replaced by a very impressive square keep (as the central strongpoint was later called) on a heightened mound, surrounded by a heavily defended series of outer baileys (recently excavated prior to the construction of Castle Mall). Interestingly, it seems that the same craftsmen that worked on the castle also worked in the construction of Norwich Cathedral (NHER 459). Some of the dressed stones in parts of the Cathedral Presbytery have masons’ marks that match those in stones of the castle keep. Norwich Castle itself has been extensively “messed about” over the years. By the 14th century much of the keep was falling into disrepair. Intermittent repairs were carried out until the later 18th century when the interior of the keep was gutted and a prison constructed inside the shell. In the 1830s the keep was refaced (some say unsympathetically) but retains some of the architectural features of the original string courses and blind arcading. The castle was eventually (in 1882) transferred to the citizens of Norwich for use as a museum, a function it still carries out, with renovations ongoing. Turning to the Norman castles built by the incoming lords on their new lands, it is important to emphasise that no two castles were alike. The local topography, tactical considerations, the wealth of the owner and many other factors, all contributed to how and where the castle was built. Also it must be remembered that post-Conquest England was an extremely unstable place to be, with rebellions occurring on a regular basis. Probably the worst period was “The Anarchy” (1136 to 1154) during the reign of King Stephen, when it is likely that some of the smaller motte and bailey castles were built (e.g. Wormegay (NHER 3455), Denton (NHER 11047), and Horsford (NHER 8001). These were earthwork castles with timber defences and buildings. Other existing castles may have reacted to threats by beefing up existing structures. For example, Castle Acre (NHER 3449) a stronghold of the Warenne family, was initially built (in the later 11th century) as a lightly defended but large stone built country house with a bailey. However, probably during the Anarchy, the house was converted to a massively strong keep, and its perimeter defences upgraded. Some castles of the time had a square stone keep on a motte flanked by two baileys (e.g. Mileham (NHER 7230). 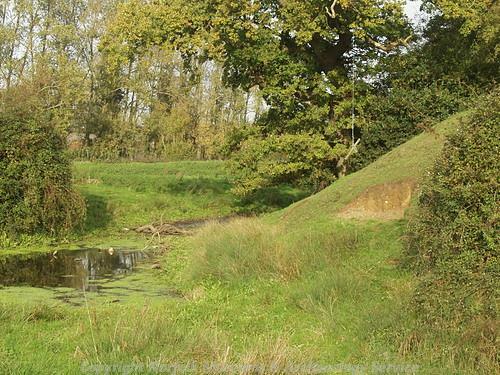 Others, like Middleton (NHER 3394), Raveningham (NHER 10535) and Quidenham (NHER 10785) seem to consist of a motte with no visible evidence of a bailey (though at Middleton, the bailey may have been levelled later). It is very likely that some of the lesser earthworks have disappeared entirely. For example, the motte thrown up within the late Roman fort of Burgh Castle (NHER 10471) was levelled in 1839, and only faint traces of it remain. As the more powerful Norman lords consolidated their position, their castles became more ambitious, and indeed started to affect the location of the surrounding populace. There can be no two better examples of this in Norfolk than Castle Rising (NHER 3307) and New Buckenham (NHER 40577). Both were built as new by William II of Albini in about 1140. Castle Rising keep is of a traditional rectangular design, but New Buckenham has the earliest known circular tower keep. What these two sites had in common was that as well as William building the castles, he also moved the old settlements lock, stock and barrel to a new site next to them. He also provided a new church. The construction of New Buckenham was to mark William d’Albini’s marriage to Alice, the widow of Henry I in 1138, and his elevation to an earldom. 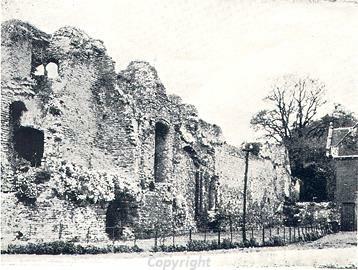 The old family castle in Old Buckenham (NHER 9202) was demolished, and the land used for the foundation of a priory. All that remains of the old castle today is a double enclosure surrounded by a ditch and bank. A similar earthwork at Weeting (NHER 5626) enclosed 12th century and later stone buildings as well as the remains of a small motte containing a post medieval ice house. Although it has broadly been stated that the siting of castles was primarily governed by military considerations, recent analysis has convincingly suggested that they were positioned more in order to visually impress. 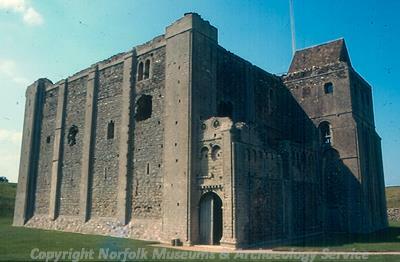 For example, Norwich Castle (NHER 429) has many blind spots and the architectural embellishment of the keep means that it is compromised militarily. However, it remains an impressive statement of power. Also at Castle Acre (NHER 3449) the castle was built directly over a Late Saxon hall, probably a statement of the continuity of authority. The same research has suggested that castles were often sited towards the common edge to preserve good arable land. The ruins of Claxton Castle. It should not be forgotten that there was a very strong element of social climbing evident in the new land-owning aristocracy of the immediate post-Conquest period. An alternative explanation for the strengthening and alteration of Castle Acre has been advanced with this in mind. The Warenne family, who built the castle, had been one of the pre-eminent land owning families in the region after the Conquest. But William d'Albini’s marriage to Alice catapulted him into the highest level of society. Part of his response to his newly elevated status was the construction of his castles at New Buckenham and Castle Rising. Both were visually impressive; the round keep at New Buckenham (perhaps modelled on Henry I’s keep at Vernevil in Normandy) was the first known in England. Castle Rising borrowed much from the Royal Castle at Norwich in terms of external features. Confronted by these (rather opulent) statements of social arrival, it may well be that the Warennes strengthened and upgraded Castle Acre as a “keeping up with Joneses" response. The gradual stabilisation of the country led to a change of emphasis in the use of these castles. Increasingly the keep was regarded as less of a residence and more of a fortified fallback position in case of attack, with new halls built in the more spacious bailey (or lower ward). 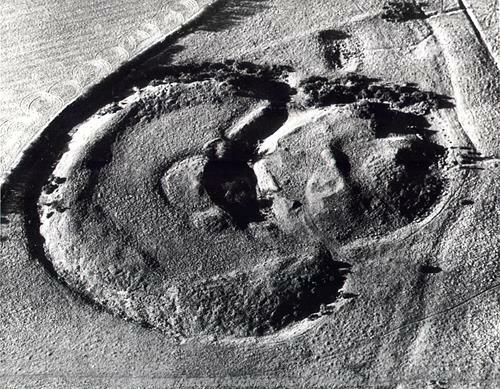 A good example of this may be seen at Castle Acre (NHER 3449) where the outline of a later hall can be seen in the lower ward. This has yet to be extensively excavated, but a circular depression within the outline may suggest the presence of an undercroft. By the late 14th century, most Norman castles had become decrepit. In many places, once they became disused, local communities found them a useful source of building material. In some cases, the decay came about because estates were passed through and between families, where a castle could become the property of the king, or someone whose main lands were in another part of the country. Although the need for the type of castle erected following the Conquest had generally passed by the 14th century, later landowners still built fortified manors, (or “maisons forte”). However, these, although often very impressive, were more than ever for show than for anything else. Often, licences were obtained from the king to crenellate buildings known as castles. Examples of these include Gresham (NHER 6620), Baconsthorpe (NHER 6561), Oxburgh (NHER 2627) and Marham (NHER 11462). At Oxburgh, the licence was obtained in 1482, after the building had been completed. It has long been thought that the application for these licences was a way for the King to restrict fortification. However, it has become clear that they were rather badges of status, eagerly sought by the aristocracy, and sometimes never acted upon. Perhaps the moated site Wood Norton (NHER 3085) is such an example. It should be noted that this is very much an overview of castles in Norfolk. A whole book (or more) could be written about each individual site and still not cover all its architectural history and use, or its sequence of ownership. Those wishing to dig a little deeper are referred to the further reading list that appears at the end of this piece. Piet Aldridge (NLA), July 2005. * indicates a late medieval castle or maison forte. Brown, R.A., 1992. Castles from the Air (Promotional Reprint Company). Coad, J.G., 1984. Castle Acre Castle (London, English Heritage). Coad J.G., 1982. ‘Excavations at Castle Acre Castle’. Archaeological Journal 139, 138. Heslop, T.A.,1994. Norwich Castle Keep. (Norwich, Centre for East Anglian Studies). Hingham, R. and Barker, P., 1992. Timber Castles (London, Batsford). Liddiard, R., 2000. 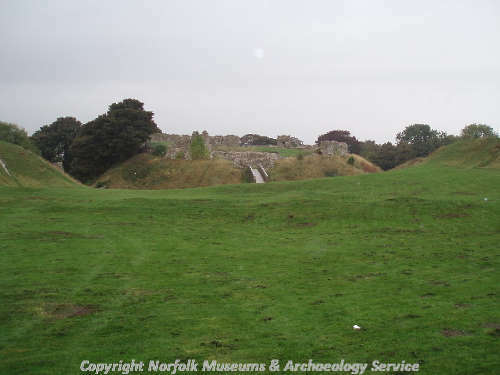 ‘Population Density and Norman Castle Building: Some evidence from East Anglia’, Landscape History 22, 37-46. Liddiard, R., 2000. Landscapes of Lordship. British Archaeological Report 309. (Oxford, British Archaeological Reports). McNeill, T., 1992. Castles (London, English Heritage). Pawsey, J., 1973. 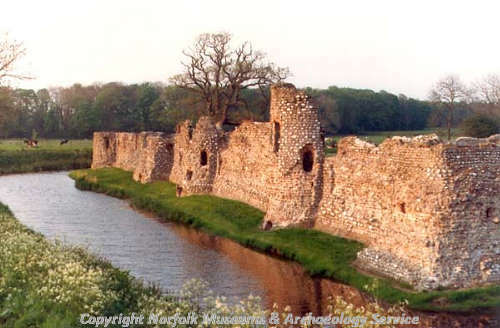 Castles of East Anglia (FW). Wade-Martins, P. (ed), 1993. An Historical Atlas of Norfolk (Chichester, Phillimore).